There are lots of books and TV shows about money, and lots of people telling you how to spend your money, how to make more money, and how to invest your money, but has anyone ever taken their focus off lecturing you about your money long enough to try explain to just what exactly it is that we’re talking about? If not, well, it’s time. He we go. The best way to explain it is to tell you a story. Once upon a time there was a woman who dealt in “collectibles,” which is a nice way of saying she was a junk dealer. In the pre-Ebay era, she would seek out garage and yard sales, and buy all sorts of old used items. She would then re-sell them at weekend flea markets, at a tidy profit. Amidst her odd and sundry inventory, she always had a box of old postcards. This was a fairly standard item offered by all of her junk-dealing colleagues. Throughout the flea market, at every table, you would see a box of old postcards. Most of the dealers offered them at a price of 25 cents apiece. This lady, however, had a different approach. She priced her postcards, not at 25 cents, but at $5 apiece. Now at this point, yes, one might think this was either an extreme case of wishful thinking, or perhaps a use of the old “higher price equals higher quality” marketing ploy . . . but even that tried-and-true method was probably not going to work with this box of old, used, ragged, stained, dog-eared, moldy postcards. The first step in learning to manage money is to understand that money is not an “object.” It never was, and never will be. Money occasionally comes in paper or metal form, but the vast majority of the “money” in the world does not exist in any tangible form whatsoever. Less than 15% of the American “money supply” exists as gold, coins, or paper. The rest of it is just numbers stored in a computer somewhere. It is not an “object” in a physical sense. And even the “value” of “cold hard cash” goes up and down, depending on various market factors. So if money is not an object, if it is not coins or ingots or pieces of paper, then what is it? For the answer, the first clause, “If you really want it,” tells us much. 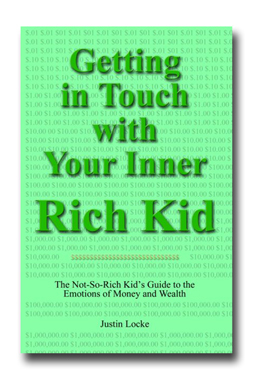 At its most basic level, money is simply a number that we ascribe to our desires. It is a number that expresses how much you want something. So whenever we talk about money, we always have to somehow reconcile the money involved with the desire it represents. There is no such thing as “intrinsic value.” The value of things is based entirely on the current amount of human desire for them. Understanding the emotions of desire– yours and everyone else’s– is key to understanding money.